The Arc de Triomphe looks down upon the grand tree-lined boulevard that is Avenue des Champs-Elysées: one of Paris’ most memorable sights and one of the world’s most famous avenues. It’s not just the striking architecture that captivates visitors—the shopping street is lined with designer boutiques, luxury hotels, and fine restaurants. No Paris sightseeing tour is complete without visiting Avenue des Champs-Elysées, and the best way to soak up the atmosphere is on foot. Opt for a guided small-group or private walking tour, admire the illuminations on an evening city excursion, or visit independently on a Paris hop-on, hop-off bus tour. Alternatively, discover Paris’ most beautiful boulevard on a bike or Segway tour, a romantic horse-drawn carriage ride, or from the passenger seat of a classic French 2CV car. Wear comfortable walking shoes—it takes at least 30 minutes to walk from one end of the boulevard to the other. Paris’ main tourist information center is located along the Champs-Elysées, close to the Arc de Triomphe. The Champs-Elysées is wheelchair accessible, as are many of the shops and restaurants along the boulevard. 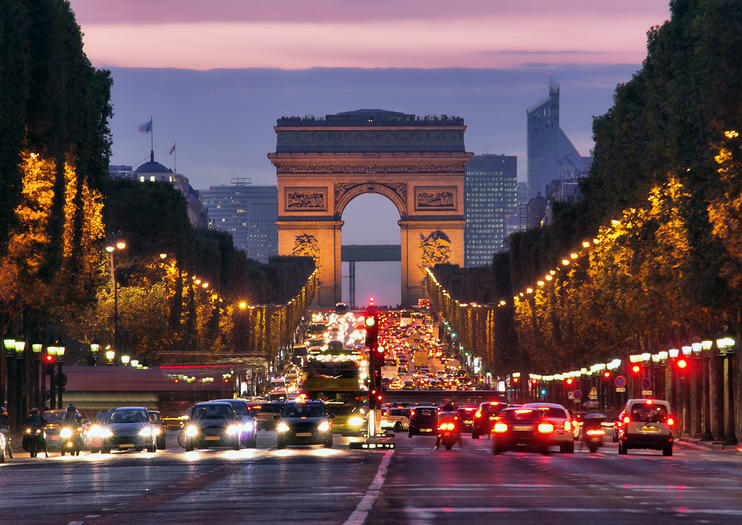 Avenue des Champs-Elysées stretches 1.3 miles (2 km) through the heart of Paris’ 8th arrondissement, from the Arc de Triomphe on Place Charles de Gaulle all the way to Place de la Concorde on the banks of the Seine River. Metro stations located along the Champs-Elysées include (from north to south) Charles-de-Gaulle Etoile (Line 1), George V (Line 1), Franklin Roosevelt (lines 1 and 9), Champs Elysees-Clemenceau (lines 1 and 13), and Concorde (lines 1, 8, and 12). As one of Paris’ busiest thoroughfares, the Champs-Elysées attracts crowds at all hours. Shoppers wanting to dodge the crush are advised to avoid weekends and holidays, while those driving should stay away from the morning and evening rush hours. The most dazzling views are found after dark, when the boulevard is spectacularly illuminated. The Champs-Elysées is also an integral part of Parisian celebrations, and some of the most memorable visits are timed to see the incredible Christmas light displays, the annual Bastille Day military parade, or the grand finish of the Tour de France. A great number of Paris highlights are located on and around the Champs-Elysées, starting with the imposing Arc de Triomphe. After taking in the views from the 19th-century monument, stroll past Charles De Gaulle’s statue, Grand Palais, and Petit Palais to Place de la Concorde, with its beautiful fountains and Egyptian obelisk. For an extended tour, continue through the idyllic Tuileries Garden (Jardin des Tuileries) along the right bank of the Seine River until you reach the Louvre museum, Palais Royal, and the Pont des Arts pedestrian bridge that crosses the Seine.